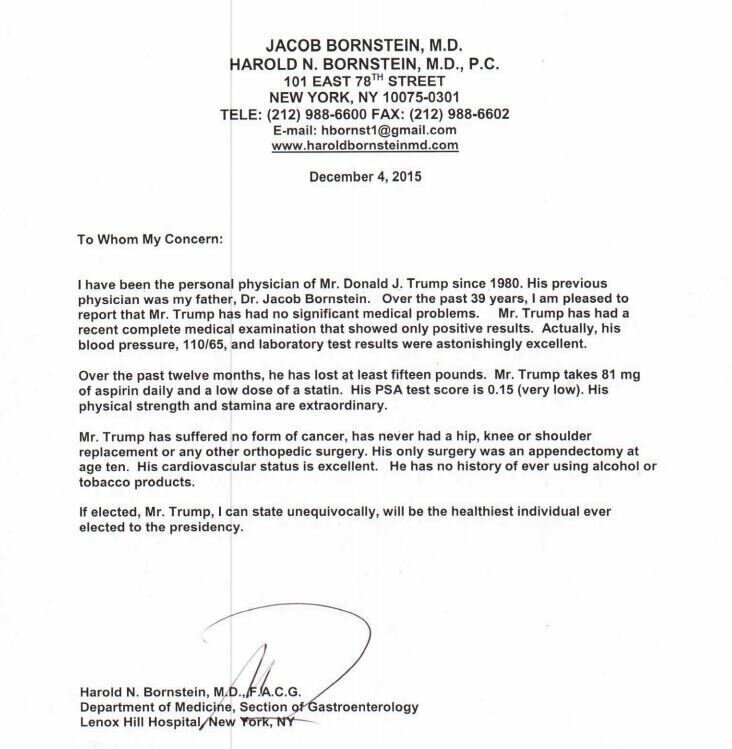 At Mr. Trump’s request, I have also looked into the health of his rival, Hillary Clinton. After a thorough investigation conducted from my bungalow in Ithaca, I am sorry to report that Hillary Clinton’s pneumonia is the worst infectious disease in the history of modern medicine. I have never seen such an extreme illness, whether in a human, an animal, or one of the alien beings that abducted me from my rowboat in 1987. Hillary Clinton should immediately cease all public appearances and consign herself to living in a bubble like the Trivial Pursuit kid on Seinfeld. This is the most gravely concerned I have ever been for a patient in my 30+ years of practicing medicine/attending Grateful Dead concerts. A cursory glance at Hillary Clinton’s face reveals that she is fighting losing battles against numerous physical ailments, including the Plague, brainpox, albinism, harsh vibes, Super Ebola, and Werewolfitis. Her LTGPH score is 1.43π (very dangerous). It has been years since her most recent cooties shot. Her liver is so unhealthy that it should technically be called a “die-er.” Lesser illnesses have taken out entire herds of cattle. Hillary Clinton is so ill that, medically speaking, she is dead. She is technically a zombie. Could Mrs. Clinton’s policies be influenced by her insatiable hunger for the brains of the living? In my medical opinion: Yes. If President Obama cares about the citizens of this country, he will immediately place Hillary Clinton into a rocket and shoot her into space. Americans should note that Hillary Clinton is extremely contagious, and, for the good of the nation, anyone who has attended a Hillary Clinton rally in the last 4-6 weeks should immediately pack all of their family members into a minivan and drive into a glacier. Given this threat, the CDC would be wise to distribute HAZMAT suits to all Americans and begin building massive bonfires where we can burn the corpses from the forthcoming pandemic. A conservative estimate suggests an inevitable death count of between 8-11 billion people—and that’s just people on Earth. I am writing this letter from the pilot seat of the spaceship I built, which I have kept hidden underneath a grain silo in my backyard. By the time you read this I will be floating in the atmosphere, safe from the threat of Hillary Clinton Disease. My spaceship is equipped with thousands of Clif Bars and the entire discography of Jefferson Airplane. I will be fine. Earth may not be. Hillary Clinton is so sick that if she set foot in another country, it would technically constitute biological warfare. If elected, Mrs. Clinton would be the first president whose entire circulatory system is constructed from virus, bacteria, and phlegm. I fully expect that her body will soon melt down like a Ray Harryhausen monster. Hillary Clinton should immediately suspend her campaign and live out her remaining days on a secluded island, where she will present no danger to those of us who do not want to be murdered by pneumonic zombies. Given the severity of Hillary Clinton's illness, I strongly encourage all Earth beings to join me in space, where we can form a glorious orgiastic commune.